In a better world this could be Duluth. …with 7 billion other humans? I have yet to proof read this. I may come back and polish it up later so be forewarned. This is a story about character assassination. I’ve been accused of it and I plead guilty to being candid. I also plead guilty to being a bit vengeful. I also freely admit that my self-defense for this, of not having been the first to cast stones, is pretty pathetic. I’ve apologized for a number of shortcomings publicly through the years but I’m not inclined to do so for taking self-righteous egoists down a peg. Such a case is Ralph Doty, former radio personality, teacher, legislator, community college president, columnist and the proud possessor of four pensions most of them public. During his stint as an editor/ columnist at the Duluth Budgeteer Ralph Doty used his bully pulpit to get some payback on Duluth Mayoral candidate Herb Bergson who was running for reelection. You see Bergson had once had the effrontery to challenge Ralph’s Brother, Gary, for the same office when the younger Doty was Mayor. An honest editor makes sure to make his criticism or endorsement of a political candidate is published a couple weeks before an election to give the target a fair chance to rebut. Ralph meted out his vengeance just three days before a primary election. Since the Budgeteer was a weekly Herb Bergson was given no chance to defend himself. That is the action of a political hack not a journalist. And what did Ralph Doty’s breathtakingly vicious attack consist of? Little more than out of context quotes from the Superior (Wisconsin) Evening Telegram covering the time Mr. Bergson was that City’s relatively popular Mayor. In Ralph Doty’s hands the criticism of Bergson put him on a level only slightly higher than axe murderers. The attack’s viciousness was probably unnecessary. Bergson was given little chance of winning his Duluth Mayoral post again in 2007. He had committed enough faux pas (mysterious auto accidents and inexplicable firings) and was already the subject of enough rumors to sink his reelection. Ralph’s hit piece probably was assembled from his younger brother’s opposition research files meaning they that were ancient history, and over eight years old. Reading old letters to the editor took little journalistic skill to ferret out. I don’t recall that Gary Doty, while undoubtedly aware of Bergson’s Superior follies, ever himself saw fit to publicize them and yet he won handily without resorting to name calling. I had reason to pay close attention to Doty’s misuse of his editorial authority since I too was a candidate that year for the Duluth School Board. Doty had already made it clear in earlier columns that he didn’t have much use for critics of the Red Plan and I wasn’t eager to see him visit the same calumnies on me. I first got wind of Doty’s infatuation with the plan when he mischaracterized the power of the Minnesota Department of Education to stop the Red Plan. Had the plan not met their criteria they could have vetoed it forcing the District to resubmit another plan. Doty quoted the Education Commissioner Alice Seagren who did once say something startlingly close to Doty’s claim about her Department’s lack of power to stop the Red Plan. I never quite figured out what Seagren was driving at because her staff later confirmed what they had repeatedly told me – that their Department did indeed have that power. I suspect Seagren was attempting to remove herself and her Department from the growing controversy in Duluth. As it was the Dept. did make the School District sweat it out for several extra months when they took a closer look at the Red Plan proposal. Because of the commissioner’s statement I couldn’t really fault Doty too much for his misinformation but after I read what he did to Bergson I realized I’d better make nice with him lest he do the same thing to me or to Let Duluth Vote. I invited Doty to meet me over a cup of coffee. I reasoned that I could make a pretty compelling case for the pro vote side in a face-to-face meeting which he would have to take into consideration if he chose to criticize me prior to the election. I was also counting on our meeting making it harder for Doty to attack my character once we’d broken bread together. We set at least one meeting date but he canceled it. He would not be encumbered with any sense of mutual respect when he cut me down to size three days before my date with the voters. This wasn’t the only meeting he skipped out on. Dr. Dixon had come to Duluth from Faribault, Minnesota under fire. This was not generally known in Duluth. I’ve written about this extensively so I won’t take up space here. Just put “Dixon” and “Faribault” in this blog’s search engine for more. Gary Glass, also a candidate for the School Board in 2007, had accumulated a wealth of critical news stories about Dixon from the Faribault Paper, probably a lot more than the Evening Telegram had devoted to knocking Mayor Bergson. Gary set up a meeting in Duluth with one of Faribault’s most vociferous Dixon critics and invited Doty the “journalist” to the meeting. As with my invitation to coffee Doty agreed to meet with Glass but backed out at the last minute. Having avoided any attempt to get fair and impartial information from Red Plan critics Ralph Doty was free to give Glass and me the Bergson treatment. Three days before the general election he raked us over the coals. In Gary’s case, he all but called him a liar for saying that JCI could earn up to $33.4 million from the Red Plan. I’ve just spent two weeks trying to get a letter-to-the-editor published about this sorry episode and reconfirmed that Gary Glass was not only much closer to the truth than Ralph but that Ralph was disseminating a blatant lie about JCI’s likely earnings. This will all be laid out in the letter to the editor which I finally got the Trib to accept after two weeks of providing adequate documentation. Glass who won despite Doty’s smear took a complaint to the Minnesota Association of Newspapers. He offered to let me join him but I figured the Budgeteer had every right to publish political rubbish. Ignorance is generally an acceptable excuse for libel. Doty had not lived in Duluth when I was on the School Board which is what he beat me up about in his hit piece. In eight years I once said “God Dammit” which proved that I was foul mouthed. It was just my tough luck that his grand embroidery was sent out to almost every home in Duluth, close to 40,000 of them. If his column caused a little over 300 voters to switch votes away from me then Ralph was the reason for my defeat and the reason the Red Plan was able to proceed. Because Gary and I were public figures I understood that we were almost completely vulnerable to criticism. Even so I was surprised that Gary’s complaint received several votes although not enough to censure Doty. Clearly other Minnesota journalists found Doty’s methods objectionable. I’ve always suspected that Doty was in Dr. Dixon’s camp from the beginning. Certainly, the letter he wrote in praise of Dr. Dixon hints at more than a mere journalistic acquaintance with the former Superintendent. Dixon had an amazing way of tracking his critics. When Let Duluth Vote published a full-page ad criticizing the Red Plan the school District countered with a two-page ad countering our arguments including one criticism that we pulled out of our ad just before publication. Someone had given our ad to Dixon before we altered it but the District deftly rebutted something we didn’t say. Dr. Doty’s unqualified endorsement of Dixon demonstrates a lack of perspective. Says Doty â€œI believe the former Duluth superintendent of schools was one of the most brilliant, courageous and gutsy administrators I’ve ever known.” It’s funny how the best Superintendent Doty ever met managed to get himself run out of two school districts one after the other. As I wrote to Chuck Frederick, a real editor who made me re-edit a 300-word letter nearly a dozen times over two weeks, if Ralph Doty really was an editor at the Budgeteer he was a disgrace to the profession. Below you will see the poor excuse for advocacy which appeared in the Trib’s letter column just before my blog went down. I composed a rough draft response dealing with Dr. Doty’s work but with no blog to put it in I laid it aside in order to write a shorter riposte for the newspaper. That is the epistle I had to keep resubmitting over and over until the Trib would accept it. After the sixth or seventh iteration, I emailed Chuck Frederick and complained that I didn’t think the Washington Post’s Ben Bradlee ever gave Woodward or Bernstein as much trouble on their Watergate stories as Chuck was giving me on my damn letter. By coincidence I had planned to write five “Thugs for Better Schools” posts. Writing 1,2 and 3 were cathartic enough for me so that I dropped 4 and 5. The coincidence Dr. Doty was to be the subject of the fourth post in the series. I’ve decided to take the rough response I shelved a couple weeks ago, and post it as Thugs for Better Schools IV to help me complete my catharsis. I’m sure I wasn’t the only person relieved to learn the recent playground fire at Lester Park school was not started by an opponent of the Red Plan. There was some quiet conjecture that perhaps someone hostile to the $296 million school revitalization plan had a role in the fire. Alas, three juveniles admitted their role in the disaster, and although the damage caused by the fire was extensive, it was nonetheless good to know that some folks still angry about the Red Plan weren’t responsible (“Two teens face charges for burning playground,” Oct. 6). Even now, nearly four months after 64-year-old Superintendent Keith Dixon retired, a few Duluthians continue to demonize him. 24 years, I believe the former Duluth superintendent of schools was one of the most brilliant, courageous and gutsy administrators I’ve ever known. He endured, and we are the benefactors. And for that we have Dixon to thank. Duluth School Board Chairwoman Judy Seliga-Punyko compared the tax impact on the average homeowner in Duluth from the school district’s operational levy request this fall to a couple of lattes a month. I think the remark displayed an elitist insensitivity toward the real financial problems many are facing. Just six days after voting to approve the layoff of more teachers, Seliga-Punyko and her allies approved $15 million more for the Red Plan. Seliga-Punyko was one of three who went one step further, trying to add another $19 million, for a total of $34 million. She didn’t ask why the plan was so far over budget or what had become of an $11 million contingency fund. Less than a year earlier, then-Superintendent Keith Dixon and Johnson Controls said they likely wouldn’t have to tap into that fund. Seliga-Punyko claimed in an article in an alternative weekly paper that more spending on facilities “isn’t costing taxpayers.” Apparently she has access to a money tree. 50-foot glass curtain walls. East High School’s expansive, radius-glass entrance came with a price tag of about $250,000. The two high schools alone cost $109 million. The chairwoman’s special project, two huge aquatic centers, will cost our community at least $11.5 million, with interest. On and on, with Chairwoman Seliga-Punyko’s approval, the district has been pouring money into bricks and mortar (and Johnson Controls’ pockets) while losing teachers, nearly 40 fewer in just the past two years. No one should be surprised when the chairwoman comes back for that extra $19 million, if she and her allies retain control of the board. didn’t bother to buy a house here. I believe Seliga-Punyko and her allies controlling the board were unwise to put their objectives above the most basic principles of democracy. Most residents have accepted the inevitability of this plan, but pushing such extravagance through without full representation has eroded trust. This newspaper reported that “several of the 36 teachers laid off earlier this year have already been recalled.” That statement was inaccurate, according to my research. Hours were increased but only one teacher actually was called back. We have new schools. It is fine to accentuate the positive. But the time has come to turn off the Dixon spin machine. Current board leadership has led the district into desperate financial shape. “A couple of lattes” is a demeaning way to request more money from hard-working citizens. We need a change of attitude toward the public. We need a change of direction, of priorities. We must get back to financial bedrock and face the reality of the moment. A half-billion-dollar investment, literally our future, is hanging in the balance. Loren Martell is a candidate for the Duluth School Board in the 2nd District. I listened repeatedly at those meetings to the man who would like to replace Seliga-Punyko on the board. He spoke at every session with no attempt at civility. He leveled personal attacks at board members and at the superintendent. His manner was consistently disrespectful to anyone who disagreed with him. In the online world this is called a “meme” meaning a bit of stuff that takes on a life of its own with repetition by others. I believe his accusation is bunk and more a reflection of the Red Plan friends impatience with the folks, like me, who never tire of pointing out all the unfortunate consequences of the Red Planners having stepped on so many toes. Loren is soft spoken and he has a legitimate beef – The School Board was covering up and ignoring public data in the form of critical letters sent to them. I suspect this began with Dr. Dixon six years ago because he didn’t want his School Board swayed from his mandate to give us new schools. Martell is stubborn, I’ll give him that. So have lots of idealistic people that we revere for sticking to their guns in unhappy circumstances. Triss and others I’ve blogged about have long felt we should get new schools and have no problem hewing to the notion that the ends (good schools) justify the means (self righteous vote theft). There is no better refutation of Ms. Harwood’s accusations than the opinion piece Loren Martell had in the same paper today. This is a thoughtful yet forceful analysis of our District’s situation. Its too bad that our School Board didn’t have the benefit of such an intelligent and articulate thinker from the beginning of Dr. Dixon’s reign of happy talk. For my vast readership of eight I’m sorry that I haven’t gotten my blogging back in gear. I think I enjoyed my enforced vacation from blogging a little too much. Vacationing has been habit forming plus the update to my blog software is requiring a little more intellectual effort on my part than I wanted. I did write a letter-to-the-editor about two weeks ago. I haven’t gotten around to counting how many times I had to rewrite and resubmit it before it finally passed muster but it must have been at least eight times. The third submission left me a tad testy and I heaped some scornful abuse on the DNT’s editors. I got it back in spades and frankly I had it coming. I backed off and began a cordial email dialogue with Chuck Frederick which gave me a chance to blow off some steam and give him some background info since he hasn’t been in the maelstrom of the Trib’s Red Plan coverage. I got the all clear today and told Chuck that my letter is better and more accurate for all the research he set me to. Look for it in a couple days. Maybe it will help to fill the void from my vacation. I’ll post it once its made the editorial page. Yesterday I woke up at 5AM and decided to swim laps for a second day straight after my three year layoff. I quit initially because fighting the School Board left too little time for personal fitness. It was probably while I was listening to Public Radio that I got the idea of buying a box of pastries for our local Occupy Wall Street tent encampment downtown. I’d enjoyed looking down at them from the Radisson a week earlier. They are more laid back than the protesters of my Era and every bit as fuzzy about how to “fix” the ailments they are concerned about. They are sure a lot less self righteous and less Dittoheadical than the Tea Partiers. I generally like them and their fuzzy focus. I figured that I’d wait till after my swim to take them food. I wasn’t sure any of them would have crawled out of the tents much before eight. Its gotten a little cold outside. When I finished I headed over to a bakery and as I put in an order for 4 dozen mixed donoughts a lady behind me said yum yum I’ll follow you anywhere. I told her she’d have to head over to the OWS protest because that’s who was going to get them. The baker gave me a little discount and told me he had some friends there. I slipped in a little cash thinking that the bakery good were more of a morale booster than anything else and wrote that it came from the 5%. 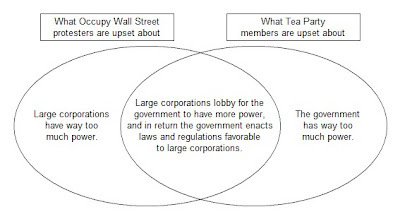 This is what I make of the OWS. For years Americans bragged about our streets of gold and viewed ourselves as a country where anyone could succeed with hard work. This graph suggests that this is no longer the case. And here’s a piece that gives more detail on how we are putting our social mobility at risk. On June 28, 2009, an explosion rocked the biomass-fueled power plant on the campus of the University of South Carolina . The force of the blast sent a metal panel some 60 feet toward the control office of the plant at Whaley and Sumter streets, according to documents obtained from USC through a Freedom of Information Act request. No one was hurt, but USC officials were concerned enough about the “potentially lethal accident” that they ordered an independent safety review and, in a strongly worded letter to the company that had built the plant, made it clear that university staff would not be allowed back into the building until the review was completed. After two cruel weeks without being able to blog it appears my blog is ready to go again. Just think of all the useful time I’ll be squandering once more. It turns out that a majority of Republicans are thinking along the same communistic lines as our Pinko redistributionist President. Since a majority of them, 54%, agree we should engage in a little class warfare by raising the taxes of the wealthy I fully expect which ever Republican who gets the GOP nod to try to out Obama Obama after getting elected. As long as a Republican President acts like Obama its not really communism. 2. Thinking beyond the 2012 presidential election, do you think your own family’s financial situation would be better if (President Obama wins a second term) OR if (a Republican wins the election) or wouldn’t it make much difference either way?